Puzzling naming sense aside, The Pilot’s Love Song is a sweet tale about love and adventure. It stars a large cast and an intricate setting, the latter which should be known to those who have seen The Princess and the Pilot as it is set in the same universe. Over the short span of merely 13 episodes – far too few for a story on this scale – it managed to live and breathe a wondrous sense of adventure I haven’t encountered very often in anime. 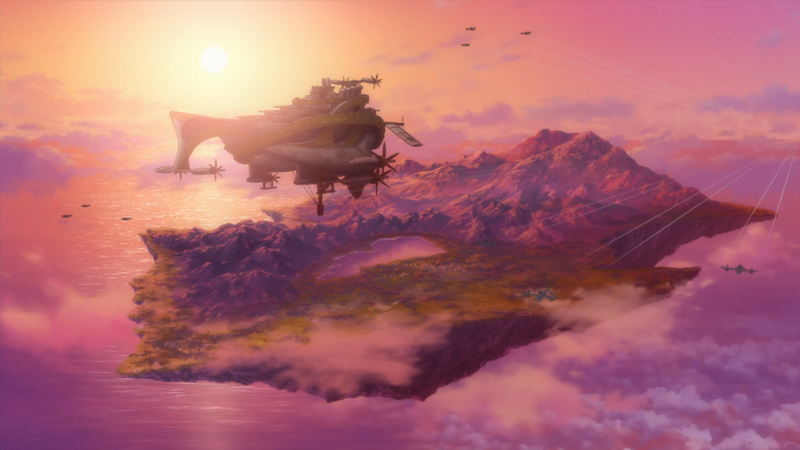 A large reason to this is the setting itself, which in the case of The Pilot’s Love Song involves a massive flying sky island and sky ships. This alone is reason enough for me to adore the series, however foolish it sounds. It is difficult to put it into words, but there is something very magical and adventurous about the sky and I adore whenever fiction uses it to its advantage. A vast, unknown world where the only possible way to traverse it is by air is exhilarating. Whatever lies behind the distant clouds? Whatever lies not only in front or to the sides of you, but also above and below? It is very poetic. As a series, The Pilot’s Love Song is disappointingly never able to fully explore its heaps of ideas and potential it sits on – something The Princess and the Pilot gracefully succeeded with – yet it remains a sweet little tale with a lot of heart. The short length is not enough to do the story justice and its slightly meandering focus halfway through – shifting the spotlight to a frustratingly predictable event – means the smaller details are never given enough time to organically grow. Instead, we are left with tidbits of information and a desire to learn more about what was left unknown. This is a shame, as author Koroku Inumura clearly has vision and a sense of scale as seen throughout his “Pilot universe”. If good things can come true, another of his titles will hopefully be adapted in the near future despite The Pilot’s Love Song’s disastrous sales. I would love to further delve into his creations and see what other stories in the mythology offers. 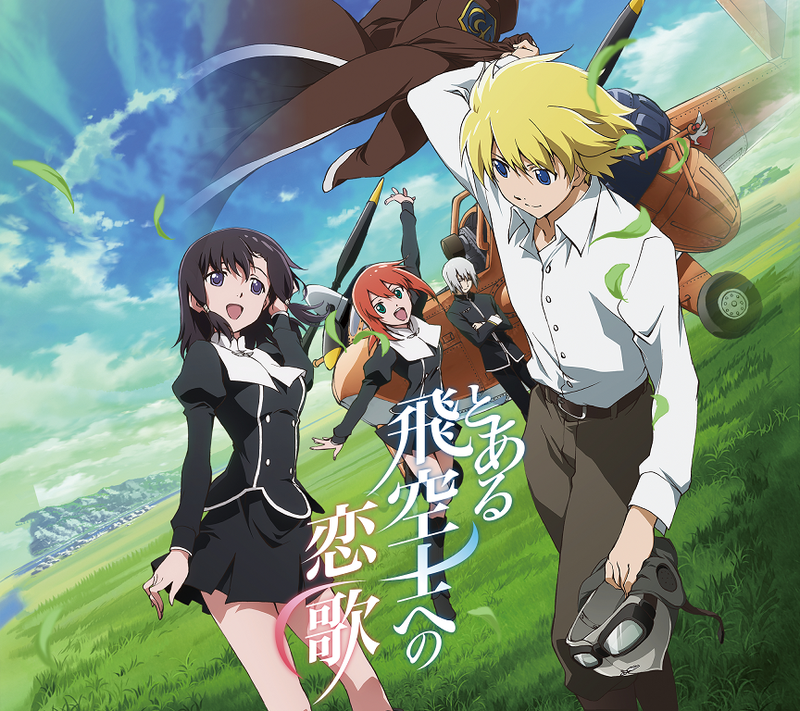 This entry was posted in Anime, Christmas, Series, The Pilot's Love Song and tagged 12 Days of Christmas, A really good imouto, Adventure, Anime, Bad sales, KoiUta, Koroku Inumura, The Princess and the Pilot, The sky is a fantastic setting, Toaru Hikuushi e no Koiuta, Toaru Hikuushi e no Tsuioku. One thing that baffled me is how I was more moved by the slice of life parts than the drama segments, something that is so totally not like me. I guess I liked the sense of incoming tragedy while those characters were having their heart-felt adventures as a group a whole lot more than the focus on indivual character deaths of people hardly fleshed out to the point of making me care beyond the group dynamics. On another note, the animation was, hilariously, way better than the art. Had some pretty neat tracks though. Yet getting my hands on an upload of the OST might be as likely as the franchise getting another anime expansion. What do I know, it’s still a decent show. Also, regarding this season, watch Parasyte and KimiUso. As for the obligatory short, you’d probably like Danna Ga a lot. I actually agree with you. The more dramatic moments, especially the one halfway through, just fell flat for me. Fearing a possible incoming tragedy was much more engrossing. As for the OST, I remember talking to you about it. Shame it wasn’t included in the Japanese box release. Is it actually common to not release the soundtrack for an anime series? I’ve never come across it before. I was thinking of giving the fall season a go during the winter holidays! Parasyte seems really good and I somehow quite like the characters designs (didn’t they get criticized for being too different from the manga?). Otherwise you’re spot-on with KimiUso. Plus Mushishi Zoku, which I’ve seen saving. Is Danna Ga actually good? It seems like the typical so-so anime short. I’m fairly sure it was included in the box release. Now, considering that one’s sales figures… eeeeeeeeh. There’s a logical conclusion to arrive at but I refuse to and would rather cling to a non-existent straw of hope. They changed Parasyte’s character designs a bit, probably to appeal to a more modern audience, the manga is rather old after all. In the protagonist’s case, he got a general overhaul for the first third to make the character development appear more drastic later on. At least that seems like a safe guess. Danna Ga is about a married anime blogger actually and how his wife has zero clues about any of his hobbies yet is always at his side. It’s rooted in otaku culture for sure but also has its sweet moments. You’d probably love the most recent episode, as it had rather well-written self-discovery drama and was hijacked by Imazaki. Right there with you on the sense of adventure. The skies and this series really do capture something. Kinda makes you wanna be a pilot. This was one coming in that I really wanted to be amazing. It never quite got there, but it managed some great moments. I really liked Kal-el and Claire’s first meeting, that was full of charm. And the scene where they forgave each other and he’s flying past her and he shouts ‘Live!’ Can’t believe that worked as well as it did. They were probably the highlights of the show for me. What were your favourite scenes? Indeed it does! … at least if we had cool aircrafs like the one featured in the series. I think I would sadly feel suffocated if I had to spend all my days onboard airplanes, though. Funny how a series can, at least temporarily, make you want to pursue something just because, isn’t it? What were your favourite scenes? That’s a difficult one! I liked Kal-el and Claire’s first meeting as much as you do, but otherwise I’m a growing fan of the final moments of the last episode. It may seem insane, seeing as it more or less implies there was more to adapt (unless the original light novels ended the same way). The reason I like it is exactly because how open-ended it is. After a fairly relaxing episode the series takes off its gloves one final time – one last spurt – where we are shown the inevitable that would transcribe. However, the resolution is completely up in the air. It creates a sort of romantic ending, where it’s heavily implied what will happen yet never explicitly shown. It is an open ending that manages to still give a sense of conclusion, something that is very hard to achieve. The Pilot’s Love Song managed to achieve just that in my opinion. I remember especially oldier movies having endings like this, as if they were cut off 10-30 minutes than they should’ve. And when done correctly, it makes creates a bittersweet punch to the gut that makes you forever wonder what actually happened. That is praiseworthy.